SURPRISE: As fans streamed in to the first day of Coachella 2019, they were greeted by an old friend: the "Space Man." 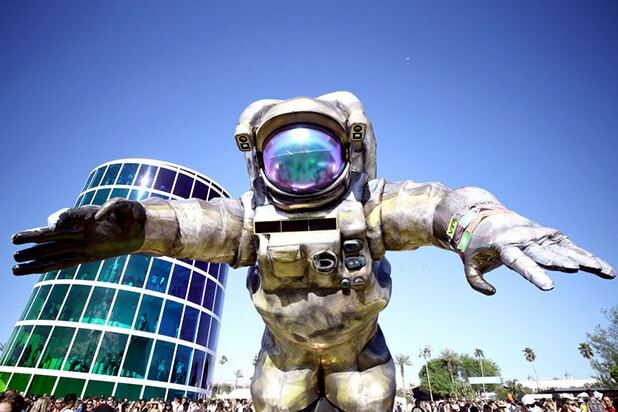 The 70-foot astronaut that roams the grounds changing colors during the day became the symbol of the festival in 2014. Slightly evolved, he (or she?) returned after five years. For the record, the art is called "Overview Effect" and was created by Poetic Kinetics. HIGHLIGHT: Despite early forecasts for rain in the desert, the weather was pitch perfect -- not windy and, most importantly, not dusty. Fans still wore face masks all night out of habit. HIGHLIGHT: The K-Pop Invasion. 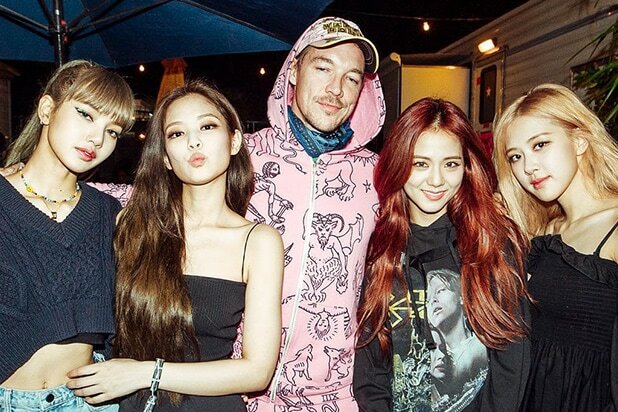 Girl group Blackpink hit hard in their first ever U.S. concert Friday night, packing the newly enhanced Sahara tent. Diplo, who has made a career out of international music and artists, was surprisingly not far behind the trend. In addition to hanging with them backstage (in black and pink clothing), Diplo delivered an all new set that beat expectations for a grizzled crowd that has seen him ad nauseam in Las Vegas. SURPRISE: Musgraves slipped in to the Coachella spirit with the requisite wack-a-doodle guest star. This is 90-year-old social media star Baddiewinkle ("Stealing Your Man Since 1928"), who danced with her at the end of her set. More bonus points: Musgraves had EDM-style visuals for her hit "High Horse." NO SURPRISE: The kids love Fisher, who drew a huge crowd on Friday afternoon. Also not surprising: the "mountain's majesty" that is part of the mythology of the desert music fest. ¡SORPRESA! : Los Tucanes de Tijuana turned the fields in a norteño dance party early on Friday afternoon. The crowd's embrace and their enthusiasm for the timeslot felt like part of "the resistance" to the president's anti-Mexican demagoguery. HIGHLIGHT: The Yuma tent, traditionally a dark warehouse-style dance den, got a makeover. With large-scale production across the ceiling, you'd never know this photo from inside the air-conditioned disco was taken around 4 p.m.
NO SURPRISE: In its second year, the Spectra structure (right) has become as synonymous with the festival as its other icon, the Ferris wheel. NEWSUBSTANCE created the structure that will be back in 2020 as well. SCARY MOMENT: A fire broke out in a portable shower trailer in a storage area of one of the campgrounds after 2 a.m. Saturday morning. According to the Riverside County Fire Department, one trailer was destroyed and another was damaged. No one was injured. At that hour, campers are back in the campsites, but it would not be a busy hour for showers. Non-camping guests would be finishing leaving the grounds, so the timing was lucky. Last year, a palm tree fell on to an empty portable toilet in the campground. HIGHLIGHT: Polo & Pan. The crowd to see French duo overflowed the tiny Gobi tent on Friday night, exceeding their billing and curating a breakout moment. 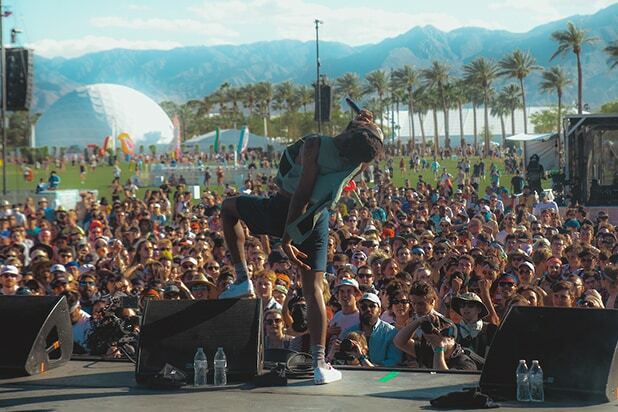 Their laid back poolside tunes drew one of the most diverse, chill and "phones down" crowds of the festival. The guys seemed to know something special was unfolding. As they began their last song, they looked at each other with some surprise and started hugging while the song was still playing. HIGHLIGHT: DJ Snake. Newly back from playing for oceans of fans in India, the "Lean On" producer reminded everyone that despite all the guitars, poolside-vibe tunes and singer-songwriters in Indio, a festival still needs to deliver the shock-and-awe production you can't get at a club or theater. He reunited all the stars of his cross-genre hit "Taki Taki" hit on stage: Selena Gomez, Cardi B and Ozuna.